Four time Grammy Award winner, Glen Velez is the founding Father of the modern frame drum movement and is regarded as a legendary figure among musicians and audiences world-wide. 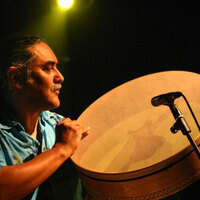 Velez brought a new genre of drumming to the contemporary music scene by creating his own performance style inspired by years of percussion and frame drumming studies from various cultures. Velez’s virtuosic combinations of hand movements, finger techniques, along with his original compositional style, which incorporates stepping, drum language and Central Asian Overtone singing (split-tone singing), has undoubtedly opened new possibilities for musicians around the globe, resulting in a shift in modern percussion. Velez is an adjunct professor at Mannes School of Music in New York City and conducts regular master classes at The Juilliard School and Tanglewood Summer Music Program. For Rhythm Vocalist Loire Cotler, life has always been about the natural rhythm of the universe which has propelled her into a life, like her music, that is defined by pure cadence and pulse. Loire has now done no less than create an entirely new genre using the intimate power of her voice as a rhythm instrument. She calls upon a distant past of sacred ritual and echo vocal traditions (the Jewish nigunim, Middle Eastern taksim and Konnakol Indian drum language). Improvising compositions that are both hypnotic and playful, she’s an artist in total command of her unique craft. Phrases like “Peerless artistry” (The Jerusalem Post), “Astonishing” (Chicago Tribune), “Jaw dropping dexterity” (Chicago Classical Review) are commonly used to describe her.